Viviane's Cleaning & Restoration Inc has provided a reliable Salem house cleaning for 17 years, offering Salem residential cleaning at an affordable price. Treat yourself and check one more thing off of your “to do” list! Let Viviane's Cleaning & Restoration Inc be your Salem cleaning service business in the professional manner that we are known for. Our customers know they can count on us for an exceptional house cleaning service in Salem with the most dedicated team of home cleaners Salem Massachusetts has seen. Don’t let house cleaning bog down your already full schedule. 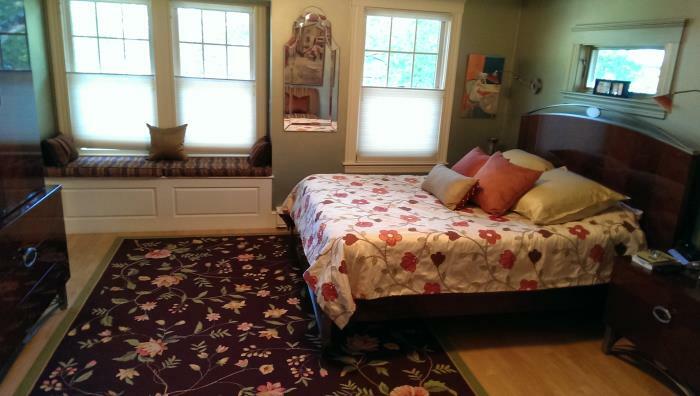 Viviane's Cleaning & Restoration Inc will assign our Salem house cleaners to do your Salem domestic cleaning for you. You can trust that when Viviane's Cleaning & Restoration Inc completes your Salem house cleaning, it will be a job well done. A house keeper Salem homeowners can trust will take the time to bring sparkle and shine to your home. Cleaning Salem homes is a matter of quality. That’s why word is out that we’re the go-to cleaning service business Salem residents rely on. Contact us at (978) 216-2484 to find out more about our flexible scheduling and our house cleaning in Salem Massachusetts. Viviane's Cleaning & Restoration Inc’s Salem residential service includes a thorough cleaning of all rooms of your house. We meticulously clean every corner of kitchens and bathrooms. Living areas and bedrooms will never look cleaner. Our Salem cleaners stay on task so that you will always rely on Viviane's Cleaning & Restoration Inc for your Salem domestic house cleaning needs. Cleaning Salem homes since 2002. Viviane's Cleaning & Restoration Inc wants your Salem home to be clean and healthy. Our Salem house cleaning staff uses proven cleaning solutions to cut clean and disinfect surfaces. Indulge in clean and call Viviane's Cleaning & Restoration Inc for a Salem home cleaning service that is dependable and affordable. 5★★★★★ - "The Viviane's cleaning team was fantastic! I needed a good house cleaning during the busy holiday season, but after seeing how great they did, I am definitely going to be a repeat customer not only for my home, but for my office as well. I highly recommend this company if you want a thorough cleaning and want to deal with true professionals. Thank you Marcus and Vivian !" 5★★★★★ - "Viviane's Cleaning did a fantastic job! The owners Marcus And Vivian are a pleasure to work with and they went out of their way to accommodate our schedule. The house was cleaner than I have ever seen it once they were done! This is a trustworthy company that communicates in a prompt, friendly, professional manner and delivers exceptionally high quality results." "I recently moved into a house that I purchased and found that it was in great need of cleaning. My friend and myself tried taking on this task and failed to accomplish much in the 5 hours we spent cleaning. After contacting quite a few cleaning services, and I find (Viviane's Cleaning) Marcus and Vivian reached out and was very quick to come inspect and provide an estimate. With such a tight timeline, Marcus and Vivian were able to come the next day and clean. I left them at my new home and came back about 5 hours later to a very surprisingly clean house! Needless to say I was impressed! I have now got Marcus' number saved in my phone and will certainly be a repeat customer. Thanks again!" 5★★★★★ - "Our condo had not been extensively cleaned in years. We reached out to Marcus and he responded promptly and came over to take a look at our place. He offered us a fair quote and he addressed all of our questions and concerns. Marcus and his team deep-cleaned our condo while we were on vacation, and when we came home it was like walking into a new place. Everything was spotless and we couldn't find a speck of dust anywhere. Our stove and refrigerator looked like new inside and out. Marcus is extremely responsive and professional and I would recommend this service to anybody." 5★★★★★ - "Marcus and his team, led by Vivian , were the most courteous and knowledgeable professionals in their field. They were prompt, helpful, and able to attend to our damaged floors in a timely and rapid manner. We used them for our flood/leak related issues and would call on them again. We would highly recommend these highly trained professionals for any disaster relief issues. Thank you Marcus and team for all your help !" 5★★★★★ - "Highest Honors to Viviane's cleaning ! A December 2017 Nor ‘Easter brought up to 6” rain and caused extensive flooding in the area. The first time in 11 years that my basement took in water. Even though Viviane's cleaning was fully booked given the extensive damage in Salem Mass and surrounding communities, Marcus Viana , Viviane's cleaning owner, took extra measures to summon team members and equipment to attend to my situation. There was a mutual recognition that time was of the essence in order to prevent permanent damage and spare significant expense. Marcus staff was top-notch, a true reflection of an organization dedicated to client service. I can’t thank the Viviane's cleaning Team enough for their dedication and high touch service, Five stars..."
5★★★★★ - "I couldn't recommend this crew more highly! A pipe burst in my apartment over the weekend and after it was fixed and the water had been removed the floors were coated in a layer of black soot. Marcus and Viviane From Viviane's Cleaning was in my apartment for just over an hour and when I returned the floors were immaculate. There was also a very pleasant floral smell from whatever they used to do the job. Marcus insisted on cleaning the hallway floors as well for no extra charges. I still can't believe how quickly and how thoroughly everything was cleaned. Professional all the way around. I would gladly do business with this team again ! Thank you very Much , Marcus and Viviane Great Job Guys !!!" 5★★★★★ - "We have just begun but I notice Viviane and Marcus are responsible with their time and have been very good about working with me. They come to my house every week and I appreciate that they come in with a price to start that was not ridiculous because it was a first time. They wanted me to be happy with them and it was a fair way to show what they can do and I so appreciated it." 5★★★★★ - "Viviane's Cleaning, most professional, honest people you could hire. Great service and phenomenal at their cleaning skills, I leave my door open to them and trust them completely. My house has never been so clean, the price is very reasonable, and they work exceptional. 5★★★★★ - "I cannot express how satisfied we are with Viviane's Cleaning! They are very trustable, flexible and I can always count on them !! The owner Marcus is always on top of everything to make sure we are happy with the services provided. I strongly recommend their services, fantastic service!" 5★★★★★ - "Viviane's Cleaning's team consistently does fantastic work. They are highly professional and dedicated. My home has never been so clean. From the first top to bottom clean to their fort-nightly visits, they are always diligent, trustworthy, respectful and thorough. Thank you for making my home sparkle, great job guys, highly recommend Viviane's Cleaning !!" 5★★★★★ - "The best Vivian and her team have been cleaning our house for about seven years now, and we couldn’t be happier. Marcus and Vivian have helped us prepare our old condo for sale, and scrub down our new home before we moved in. Both clean as if they owned the place - with meticulous attention to detail. Everything looks spotless and brand new after Vivian has visited - it’s a great feeling to return to our home after She and her crew hand cleaned. Not quite sure how she managed to get rid of some of the kitchen and bathroom residues. What’s more, is that we trust Vivian without reserve. She has her own set of keys to our home and is a true professional. 5★★★★★ - "Vivian and Marcus have been our housekeeper for over 10 years.. I have never found anything to be broken or lost after both are here. Marcus and Vivian communicate well with our family if there are any changes in the schedule for cleaning. I find her to be most efficient, a very hard worker, pleasant to speak to, and a very honest person. Vivian has never increased the price of cleaning our home, however, due to her efficiency we have voluntarily raised her amount of pay based on her performance. Vivian has also been recommended by our family to several neighbors and our adult daughter and continues to maintain working relationships to all we have referred. I would recommend Viviane's Cleaning to anyone in need of a cleaning service"
5★★★★★ - "Vivian and her wonderful helpers have been helping me clean both my own house and several weekly "vacation" rentals for the past 11 years. Vivian is a first-rate person and she runs a tight ship as far as her cleaning business goes. She doesn't miss a detail and is always prompt to suggest what's needed in every rental unit each week. This is a HUGE help as we need to have things perfect for the next guests checking in. One could never find a better cleaning service and everyone I've recommended to call Viviane's Cleaning for any Cleaning Services, has been thrilled." 5★★★★★ - "Marcus and Vivian and the crew have been working for me in my home for several years. They are invariably smiling when they arrive, are flexible if I need them to come another day, are willing to go beyond the routine cleaning chores and always leave the house sparkling. I highly recommend Viviane's Cleaning to anyone looking for an excellent cleaning company." 5★★★★★ - "Marcus and Vivian's team have been cleaning my house for a number of years, and they do an excellent job. It's so nice to come home to clean, pet-hair-free floors and a sparkling bathroom. Marcus cares about his business and is in it for the long term, and it shows in the consistently high quality of her work and his team's work. I hope to be with Marcus and Vivian for many years, great job guys!" 5★★★★★ - "Marcus and Vivian are the best! Both have been cleaning my old house now for a couple years, through renovations, major and minor, and I always know I’m going come home to a sparkling clean house. And, because both use all green cleaning products, it never bothers my asthma! I can’t say enough good about Viviane's Cleaning - they’re awesome!" 5★★★★★ - "Viviane's Cleaning is amazing! I came back to a sparkling house. They got every speck of dust, got my stovetop looking factory-fresh, and even cleaned the gross plunger in my bathroom sink (!). Marcus and his team were a delight to work with, very good quality of work., I am very happy, highly recommend Viviane's Cleaning for all my friends and family. 5 Stars ..."
5★★★★★ - "I have been using Viviane's Cleaning services regularly for 6 months and have LOVED it. They do an excellent job keeping our 3 bedroom, 2 bath condo clean and free of dog hair. We have 2 dogs and my mother and some friends of mine are highly allergic to pet hair so it is important to us that the pet hair be kept after and Marcus and Vivian Maid does an absolutely fantastic job with this. I am always excited to get home after work on days when I know they have been at the condo to clean. I have found the maids to be incredibly good at their work, punctual, and trustworthy. The prices for services are also very reasonable. The communication with the main office via telephone and email is also very reliable and friendly. I would highly recommend Viviane's Cleaning for any type of cleaning services ..."
5★★★★★ - "I have an older aunt in the Topsfield area who had knee surgery and isn't able to move around much, let alone take care of regular house cleaning tasks. I searched, interviewed, reviewed at least 3 companies and decided that Viviane's Cleaning was the right choice. It's been about 4 months and my Aunt has nothing but great things to say. They are polite, professional and do a fantastic job she says. I am just thankful that my first choice was a good one, anytime you have someone coming into your home you don't want there to be any mistakes. I can assure you, if you need or want a cleaning company, this is a great one , Thank you, Marcus, for fantastic service you provide for me. Five stars for Viviane's Cleaning ...."
5★★★★★ - "Viviane's Cleaning company - Very responsive customer service. Easy to reach, friendly staff, and the cleaning crew was attentive to details. I placed the booking online, and asked for Eco friendly products. They even cleaned the sides of my oven, which I would have never thought I could reach. I would recommend them if you are looking for ease of booking, great customer service, and great cleaning"
5★★★★★ - "Viviane's maid services did an excellent job of cleaning my greasy kitchen and sorting out stuff . Very handy help for working women ... Would definitely recommend. It's such a great feeling to come back to a clean and organized home after work." 5★★★★★ - "Today was my first experience, the crew was on time and the owner, Marcus, personally came to introduce the team as well as walk through the house to ensure that nothing was missed. I have worked with many cleaning services, however, this was very professional and I will be signing on for the year! They are well priced and have been very responsive right from the start! A very happy and satisfied client !" 5★★★★★ - "Viviane's Cleaning did a fantastic job cleaning my house! The experience of having Marcus and Vivian come to my house was completely stress-free and they did a great job cleaning all the spots and corners that my previous cleaning company left neglected. I decided to go with Viviane's Cleaning based on positive on-line reviews and I am so happy I did. They are nice, professional and very attentive to detail. I look forward to having them come every week from now . Thanks Marcus and Vivian for a fantastic job ." 5★★★★★ - "Viviane's Cleaning; Marcus came with Vivian, and they were very good. They cleaned doors, floors and bathrooms, they didn't miss a thing! I am very pleased and can't wait for them to come back again. She is quick and does a really good job! Thanks Marcus, you let me enjoy my day off with just laundry and dinner to do! You guys are a life saver , five stars for both !" 5★★★★★ - "I don't have words to describe their services are just wonderful. Marcus and Vivian are very sweet and pay attention to everything that I had asked for. Both are very detailed oriented and never leaves dirt behind. I really appreciate the work that this crew is doing in my home for about 4 years"
5★★★★★ - "They did a fantastic job cleaning my house since the first time. I already have their services for about 2 years and I am always satisfied with them. I really have to recommend such a beautiful job. They are very thorough, go under everything and make sure that each corner/ spot is cleaned and sparkle. Thanks Marcus and Vivian !!!" 5★★★★★ - "Viviane's cleaning this company really does give an excellent residential cleaning service. The maids were nice and thorough with the cleaning. Easy to communicate with them. The pricing is just right. The cleaning was done in just a day without problems and no spot of dirt to be found. I am so glad that I got to have their service , Thank you again Marcus And Vivian !" 5★★★★★ - "For medical, infection control reasons I needed everything in my house cleaned and sterilized - carpets, area rugs removed, furniture and curtains. It was short notice and Marcus From Viviane's cleaning came in and did everything beautifully. They were very careful with furniture and moving things. The area rugs were cleaned, stored and returned/replaced when I was ready. The team was professional and cheerful. Communications and arrangements were easy - they accommodated my schedule and were there when they said they would be. I will definitely use them again." 5★★★★★ - "This company really does give an excellent residential cleaning service. The maids were nice and thorough with the cleaning. Easy to communicate with them. The pricing is just right. The cleaning was done in just a day without problems and no spot of dirt to be found. I am so glad that I got to have their service , Thank you again Marcus And Vivian !" 5★★★★★ - "I've worked with Viviane's Cleaning for both my home and office in Boston. Marcus is not only very responsive and fairly priced, but is a professional which is more important to me than price. Very comfortable with them in my home, office and around my clients and the results are great! I highly recommend Viviane's Cleaning !" 5★★★★★ - "Viviane's cleaning , Marcus and Vivian have been cleaning my home for several years and I have been consistently very happy with their service. Most of all, I trust them fully in my home, even when I'm not there. It is such a treat to come home to a wonderfully clean house! I would recommend them to anyone. Thank you so much guys for everything , you guys the best !" 5★★★★★ - "I have used Viviane's Cleaning for the past 4 years Marcus and Vivian they are AWESOME. They are dependable, easy to coordinate with - and of course, great cleaners. From scrubbing the baseboards to mopping the floors to deep cleaning the bathroom, they have great attention to detail. And, they are nice. I highly recommend hiring them - you will be happy you did , Thank you Marcus and Vivian , You guys is Fabulous !" 5★★★★★ - "We've been using Viviane's Cleaning for about one year and we are very happy with their work. They are easy to have in our home, and they often ask if we're happy with their work. I wouldn't hesitate to recommend Viviane's Cleaning to family and friends. Great job !" 5★★★★★ - "We have been working with Viviane's Cleaning for almost 6 years and recommend them highly. Marcus, Vivian, and the crew are prompt, reliable, professional, super friendly, and best of all, they consistently do a great job. The always go above and beyond. I love their extra personal touches. If you're looking for help in your house, look no further..."
5★★★★★ - "I have been using Viviane's cleaning for about 3 years now and I love them. I always breathe a huge sigh of relief when I come home and they have cleaned. My apartment always looks awesome and they are easy to schedule with and very reasonably priced. They are the best , Thank you Marcus and Vivian for the fantastic job !" 5★★★★★ - "I am the longest client of Viviane's Cleaning Service. We have been together since Marcus and Vivian first started her business and I first bought my house here in Wakefield in 2002 . Not once have I ever been unhappy with her work. Unlike most cleaners who get laxed over time, Marcus and Vivian always do a GREAT job. Both are as good today as were in 2002 ! I recommend this service to anyone. Another thing I have to mention is how honest Marcus and her workers are. You can leave your Rolex watch or a dime on the table and both will be there when you return! This is a great service I enthusiastically give Viviane's Cleaning FIVE STARS !!!" 5★★★★★ - "Viviane's Cleaning is extremely professional and does fabulous work. It's always so nice to come home to a spotless apartment ! Very reliable for regular cleanings and Marcus and Vivian are also incredibly accommodating for short notice "I have guests coming this weekend" cleanings. I highly recommend!!" 5★★★★★ - "This company Viviane's cleaning , They have been cleaning my apartment for the last year, and I have never been so happy with a cleaning service. I have had various companies in the past clean my place, but no one has ever done even half as good a job as this company. Attention is spent on the details, and I am always so thrilled to come home to a place that not only smells fresh and clean, but actually is fresh and clean. The company has the keys to my apartment and the team is completely trustworthy. I feel lucky to have finally found such a great cleaning company and I would recommend them to anyone , Thank you guys !" 5★★★★★ - "Very happy with Vivian and Marcus and her team. They are very efficient and do a great job. After coming off of a bad experience with Merry Maids, it was great to find somebody who is trustworthy and reliable. Vivian and Marcus are very responsive and easy to get in touch with over email, text or cell. I would highly recommend Viviane's Cleaning , The feeling of coming home from work to a spotlessly clean home is very addictive , I love , you guys wonderful...."
5★★★★★ - "Viviane's Cleaning ! Marcus and Vivian, very professional & thorough service, reasonable rates & flexibility in scheduling. I cannot say enough good things about this service - there is nothing better than coming home to a sparkling clean home after a very busy day. I'm located in Saugus -Mass , so they are willing to travel !" I have Vivian and Marcus come to my house twice a month -- but wish it was every week! Vivian and Marcus are very professional and show up on-time as promised (or if she can't make it, she will call to re-scheduled etc) They do a fantastic job of cleaning my 6 bedroom house, kitchen, living room, dinner room and 2 baths ! Now both maintains the place with weekly visits. I totally trust her and him , they are in and out in 3 hours or so -- the place always looks great. Both really pay attention to the details ! Great service -- I highly recommend them !" I had a tenant in my condo for three years and recently moved back to the area. When it came time to move back in let's just say it was in a serious state of disarray. There were 3 years worth of built up grime. After 5 hours , Marcus and Vivian had given it a thorough deep clean and had the place glistening. Marcus and Vivian also couldn't be more pleasant. I would strongly recommend Marcus and Vivian from Viviane's Cleaning , Service to anyone , Thank you guys , very good job, hard work you guys..."
5★★★★★ - "I have been using Viviane's Cleaning for about 3 years I love them. I always breath a huge sigh of relief when I come home and they have cleaned. My apartment always looks awesome and they are easy to schedule with and very reasonably priced. They are the best !" 5★★★★★ - "I have been using Viviane's Cleaning for five years and I can't imagine my life without them! I have an enormous, hairy dog that sheds a lot, as well as two small children. When they clean, there is not a hair left in sight. I have had many cleaners over the years and they are by far the best, and as such, I recommend them to everyone I know. They can be trusted, they are punctual and they will follow your unique instructions to a T. The other thing I love is they are super open to your feedback. If something isn't to your liking, they will make sure they make the necessary changes and that you are a happy customer. 5 stars for sure , Thank you guys !" We love Marcus , Vivian , and their team! I can't imagine that a cleaning service could be any more reliable than they are. They've never missed a visit in 2 years, and they always leave our home looking fresh and shiny. We communicate mostly via text and pay via Credit card - couldn't be easier. On the rare occasions that we request improvements, Marcus is always extremely receptive and kind. On top of doing a great job with cleaning, everyone on the team is friendly and caring, and we're lucky to know them!" 5★★★★★ - "We have been using Viviane's Cleaning for 4 years and could not be happier with their service. Marcus and team are wonderful and are so thorough and reliable. They are also fantastic with our two young children. I have recommended them to all of my friends and everyone absolutely raves about their work. I cannot say enough wonderful things about Viviane's Cleaning and I strongly recommend them to anyone looking for a fantastic cleaning company!" 5★★★★★ - "Viviane's Cleaning Services provided superior cleaning service at my home. The staff members were extremely thorough, efficient, and courteous. They treated my home with the same care and attention to detail that they would their own home. The job they did was beyond my expectations. Prices are reasonable, and the owner of this company is clearly dedicated to honest, quality work and service. I highly recommend Viviane's Cleaning . I have used their services for more than a year on multiple occasions, Viviane's Cleaning , I have never been disappointed in the quality and professionalism of their work." 5★★★★★ - "Such a wonderful experience working with Marcus and Viviane. My home is sparkling clean and I couldn't be happier. I look forward to having them back in the future! I would highly recommend them! 5★★★★★ - "Marcus and the Viviane's Cleaning team just did a deep cleaning on my house. They worked non stop for almost 4 hours. My house looks & smells amazing. The staff is friendly and thorough. Every corner of my house is cleaner than its ever been. I highly recommend Viviane's Cleaning and can't wait to have them back next Week..."
5★★★★★ - "Marcus and Vivian from Viviane's Cleaning, Inc. have been cleaning our home for almost five years. They were recommended to me by friends whose home they have cleaned for over 8 years. They have always been thorough in their cleaning and respectful of our belongings. They have never broken or damaged anything in our home. My family trusts them in our home alone without reservation. There is never a problem if a cleaning time or day has to be rescheduled. They are also friendly, conscientious, reliable and reasonably priced. I highly recommend them and I know you will be very satisfied." 5★★★★★ - "Viviane's Cleaning and the staff that assist Marcus do a very thorough job. He goes above and beyond the actual cleaning. He is mindful of sharing when he notices an insect(s) in case it is a sign of a larger problem with your property. They are dependable and states that he will stand by his work, which I've never had to address the work that they do as I am always pleased. He does great work for a good price. Glad I was able to find Marcus Vivian from Viviane's Cleaning at a time that I needed cleaning services , Thank you !" 5 ★★★★★ - "I walked into the house today after our first cleaning and was blown away at how wonderful the house looks! Every inch of the house was cleaned and it smells great. It's very reassuring to know that all the chemicals used are non-toxic. I will highly recommend Viviane's Cleaning for Green Cleaning, to all my friends and family. They you guys; Marcus and Vivian, you the best"
5★★★★★ - "We have been using Marcus and Viviane's services for over 6 months now. We hired them to clean our freshly renovated colonial in north reading and could not be happier with the services they provide . They are extremely courteous and respectful of our time, always willing to accommodate our busy schedule. We really appreciate them paying great attention to detail and making sure that we are happy with the result. They are always very responsive to our requests and willing to go above and beyond . We love coming back home after Marcus and Vivian clean it spotlessly . They deliver a great quality at a very reasonable price. We would highly recommend their services." 5★★★★★ - "Viviane's Cleaning services have been reliably cleaning for my home for over 4 years. They are extremely dependable and always have a high quality of work. In addition, they are very warm, nice people who we enjoy having in our home. My young children look forward to the days they come and often greet them with big smiles when they arrive! " 5★★★★★ - "Viviene has been cleaning my house for the last ten years and I couldn't ask for a better and most reliable person to clean my house. I feel very comfortable and always know that the house will be very clean after each visit. I definitely recommend using Viviene and her team!" 5★★★★★ - "Viviane's Cleaning its The Best , What a joy to come home to the scent of a sparkling clean house and smell good. Always completely accommodating. Attention to the smallest details. I've always felt safe having Viviane's Cleaning services in my home thank you for great job you guys do ....."
5★★★★★ - "I 100% recommend Viviane's Cleaning for all your housecleaning needs. Viviane and Marcus have been cleaning my home for the past year and a half and the quality of their work is always outstanding. They are reliable, flexible, and their rates are reasonable. They are wonderful people and completely trustworthy - not only do I enjoy seeing them on the occasions when I'm home during their cleanings (even my shy dog loves them), but I feel completely at ease having them in my house when I'm not home. I had previously used another cleaning company that sent out a different employee for each cleaning, and I feel much more comfortable knowing my home is in Viviane's capable hands. And after a long day at work I love coming home to a spotless house!" 5★★★★★ - "What a joy to come home to the scent of a sparkling clean house and smell good. Always completely accommodating. Attention to the smallest details. 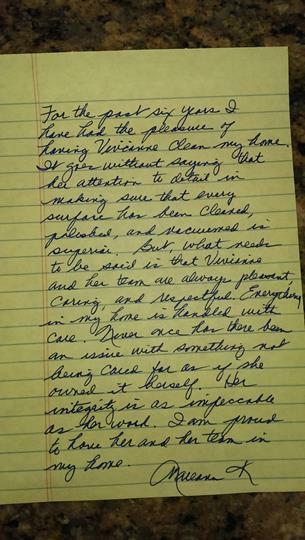 I've always felt safe having Viviane's Cleaning services in my home." 5★★★★★ - "Marcus was a great person to work with. He took GREAT detail in his work. I was so impressed with his work. I hired Viviane's Cleaning to do the job I am so happy. Thanks Marcus for the great job you did!" "I am writing to refer both Viviane and Marcus Leal as housecleaners for your home. This terrific team has been coming to our home for over 7 years. They have always arrived on time and cleaned thoroughly and efficiently. They are meticulous about getting to all of the tough to reach places and this job is performed consistently on each visit. There are 2 adults, 2 children, and 2 dogs that live in our home, which means a lot of action and the house, rugs, walls, and floor take a beating. Viviane and Marcus help to erase all signs of chaos that go on daily in our home. I will also compliment their attention to the schedule. I have not had one cancellation in 7 years, and rescheduling has only happened due to holidays. Viviane is great about being flexible with these occasions and will always fit us in. I often work from home and have observed these two working. They are truly moving the entire time! They move beds to get the dust bunnies, tables to reach fallen crumbs, and dust and polish shelves that even I am not tall enough to reach. One added bonus is that both Viviane and Marcus are sweet, caring, and honest individuals. I have enjoyed a quick chat and cordial smile when they arrive and recommend them both in the highest regard." "Viviane's Cleaning Service is the best! I've tried several other cleaning services and they were sub par. A few of them even skipped the bathtub! Anyway Viviane and Marcus do a very thorough job! They are reliable, always show up on time, clean my entire apt. including inside the refrigerator, the trash cans.. They include services that others don't. They are also very friendly and efficient. I look forward to them coming every other week to clean my place. They leave my apt. perfectly clean and sparkly." 5★★★★★ - "I just wanted to thank you again for doing such nice work at my house. I'll be away several days next month and leaving for SC mid to late January. Will be back in May. I will contact you then for some help with spring cleaning and washing windows/screens." 5★★★★★ - "Hi. My name is Beatrice Flammia. Viviane and Marcus have done cleaning for my daughter and myself for over 10 years. They are the best. We have become very close with them both. They are experts at what they do. Extremely professional. I actually consider them friends." 5★★★★★ - "Viviane and Marcus have been cleaning our home for over three years. We are extremely happy with how well they clean our home. I am always impressed by how they go above and beyond what I've asked them to clean. I love walking in on Friday after they clean and my whole house is spotless and smells fresh. They are trusting, reliable, and very personable. I would highly recommend them both." 5★★★★★ - "We had them come in for some post-construction cleanup. We were blown away by the quality of their work, and how thorough they were. Marcus and his team went above and beyond our expectations, and we’d love to have them clean our house regularly. Our hardwood floors look brand new. Highly recommend!!" 5★★★★★ - "We experienced a mold problem in our downstairs family room due to a leaking waste pipe which went unnoticed for some time. Our insurance adjustor suggested Vivianes Cleaning Inc. We contacted them and Marcus came out and inspected our problem. Shortly thereafter we received a call and an appointment was made to correct the problem. All personnel were excellent in performing their job and correcting our problem in one day. Hopefully never, but if I have a future issue, I will call Marcus for mold remediation!" 5★★★★★ - "Marcus and Vivian did a fabulous job with a deep cleaning of our entire house last week. They are both friendly and professional. They left our house feeling like brand new. We highly recommend Viviane's Cleaning to anyone looking to have their house or business cleaned, great job guys ..."
5★★★★★ - "We were so pleased with the great work that Marcus and Vivian did to clean our roof. Our contemporary house has a complicated roof with several sections and levels. It was so dirty from being in the woods under many trees. They did an excellent job and could not have been easier to work with! We highly recommend them for delivering quality work at a good price and for being so professional and reliable." 5★★★★★ - "We are so pleased with our clean roof, pool decking, sidewalks and porches! Marcus was professional, responsive with follow up emails and calls, fairly priced and did an excellent job. We will be using this company again and highly recommend them , great job now my roof is great nice and clean ...."
5★★★★★ - "Marcus and Vivian were on time, performed the service that he outlined, and then gave me a solid explanation of services provided, what I could expect to see over the coming weeks and months. They cleaned up their work and let me know I could contact them if I had any issues. I would recommend Marcus and Vivian for others looking to have their roofs cleaned ! Five Stars for Vivianes Cleaning for Roof Cleaning ..."
5★★★★★ - "Marcus responded immediately to my initial inquiry (actually answered his phone while on the roof from another job!) He was able to give me an estimate from pictures of my house that I emailed to him and shortly after, he came out to the house to do the work. They were friendly and professional, totally explaining the process they use as well as explaining the downside of untreated algae, moss and lichen - an eyeopener. We were more than happy with the work that was done and we would recommend them 100% ! The best roof cleaning i am very happy with my clean Roof , Five stars ..."
5★★★★★ - "Marcus and Vivian were very professional on site. He answered all my questions and referred me to a video of how important keeping Alage And Moss Off My Roof really is ! I was sent photos during the process to show me before and after shots..What a difference in my roof! I would totally recommend Marcus and his crew for Roof cleaning and whatever your needs are on his line of work , Great job guys !" 5★★★★★ - "Roof Cleaning !!! They did a great job and for a reasonable price. My roof had been very dirty because there were big trees over it. It had a layer of moss and dirt and there were even weeds growing out of it! Now it looks new and the rest of the house is clean, too. I think the price seemed fair. It was lower than I feared it would be so I didn’t even bother to get additional estimates. I think this is the best company in my area for the job and I will use them again." 5★★★★★ - "A to Z, Viviane's Cleaning was an excellent choice. They were recommended by a fellow contractor. He uses them for post construction cleanup and trash removal. I called at 9 am Monday morning to schedule an appointment for Tuesday 7 am preferably. Customer service was prompt. The young Lady, Vivian and Marcus asked all the right questions. Vivian and Marcus acknowledged the urgency of my request and promised to call me back with a plan. Within an hour Marcus was back to me with a schedule. Vivian and Marcus were coming the next morning at 7 am. They arrived with all their equipment and thoroughly cleaned out a basement that has not been cleaned in 45 year’s. They were fantastic . Five stars for Viviane's Cleaning..."
5★★★★★ - "We have been working with Viviane's Cleaning for over a 4 years now and we have been very happy with everything that they do. Their customer services is great - everyone in the office is always pleasant and they are very responsive. In addition, we have also been very fortunate to work with Marcus and Vivian , They are the best and an absolute pleasure - we always look forward to seeing both !" 5★★★★★ - "I've been using Viviane's Cleaning for my office cleaning every week for nearly three years. They're prompt, thorough, and easy to work with. Marcus has been my primary Pro for the last several months and he's lovely--friendly, good with my dog, efficient, and does a great job., Thanks Marcus for a fantastic job and the work your team does for us !!!" 5★★★★★ - "This company has the BEST CLEANING SERVICE in Boston to offer. They came on time and left my office shining. I also contracted them to do my small apartment on State St and that is always shining too ! Viviane's Cleaning is an awesome cleaning service. Thanks, Marcus, five Stars for Viviane's Cleaning." 5★★★★★ - "The entire crew was amazing ! Under the great leadership of Marcus , the foreman, the job was well organized, planned out and finished ON TIME and ON BUDGET. They were so courteous, professional, thoughtful and performed seamlessly and without a lot of supervision all the work that was needed and provided timely updates to me to assure me and answered ALL my questions to keep me informed and calm during a really stressful time ! It was such a pleasure working with Viviane's Cleaning and I would recommend them - especially the team I got assigned for the 2 day job - without reservation"
Water Damage Restoration Job !" 5★★★★★ - "Marcus and his team provided outstanding service. Response time was within 20 minutes. Pumped out 6” of storm water (our pump failed) from a flooded basement/finished family room. They left fans to dry out the place and remediate mold. Marcus worked with us while we waited patiently for our insurance company coverage/quote. I would recommend this Viviane's cleaning team to anyone!" 5★★★★★ - "Marcus and his crew are truly lifesavers. On 2 occasions we have used their services and I cannot say enough about how quickly they responded and did a thorough and excellent job. We used them for mold remediation and pest eradication and removal (Yuck). Outstanding Service! Thank you Marcus !" 5★★★★★ - "Water Damage Job! A sewer back-up is a miserable experience but if you have to go through it, this company has got your back. Our sewer backed up after a monsoon downpour. Marcus answered the phone at 9:30pm and got us in the queue for a clean-up the next day. Marcus sent out Rafael and his team the next morning and they worked to pull wet carpet out of our basement, moved bins of belongings out of basement, then cleaned and disinfected the area. Came back a week later to finish the job by removing drywall. Again, Marcus and his team worked to keep the dust down while they cut and removed wet drywall. Always helpful and friendly. They did a fantastic job! Throughout the process Marcus checked in by phone to see how things were going and to help out with moving the process forward with the insurance company. very recommend Viviane's cleaning for all my friends and family !" 5★★★★★ - "Marcus and his team at Viviane's cleaning of Salem came to our rescue when our garage and basement flooded. Marcus and Rafael were extremely kind and compassionate as well as responsive and informative. Marcus and his assistant arrived at my home as promised and swiftly took care of extracting the water, setting up equipment to dry out the area and shared their expertise on the many options for next steps in dealing with our situation. I highly recommend Viviane's cleaning of Salem - they are THE BEST !!!" 5★★★★★ - "Water Damage Restoration ! I wanted you to know that I am very pleased with how you handled my claim. I know that I will never be completely at ease with this mitigation/restoration/insurance process (I definitely don't want more practice at it either:)), but you definitely helped me feel that it is a manageable one. I appreciate that Viviane's cleaning was responsive to my situation and my needs by patiently providing detailed explanations and updates almost every day to reassure me that quality work was being done and progress was being made to restore my home and life back to normal as soon as possible. Your team was extremely professional, always on time, warm and understanding. Most importantly, I think the team did a meticulous job demolishing/sanitizing/cleaning the kithen cabinets, floors, and wall. Thank you for acting quickly and for your empathy, dependability, trustworthiness, and quality service." They did a $15k job for me. Came in right at the quote they promised, and stayed late everyday to complete it. I have worked with a lot of contractors and companies, and nobody comes in on time and cost - these guys did, and went above and beyond on quality , Thank you Marcus for fantastic job, five stars for your company !" Unbelievable staff this team is from the office to the workers, Marcus and his crew were the most polite people I've meet and very hard workers, they cleaned all day in 15 below degree weather, the house came out beautiful and they were very friendly and understanding. I will always use this company." 5★★★★★ - "Among the most responsive, effective and customer-oriented companies I have experienced. The Viviane's cleaning crews saved us multiple times in 2017 when we dealt with an unexpected issue in our basement. Even when they were dealing with a host of emergencies following historic rainfall, they responded in minutes to our call and worked into the night to resolve our problem. We are grateful for their help and would not hesitate to call them again"
5★★★★★ - "Water Damage cleaning up ! Truly impressive response time, the team arrived earlier than promised. The staff was extremely professional, courteous and helpful with remediation suggestions. They had the clean-up done within hours and then immediately set equipment to bring our facility back on-line. Their recommendations were invaluable in limiting both the damage and downtime." Viviane's cleaning is one of the most professional, competent, courteous and helpful businesses I have dealt with in many years. Marcus and Vivian had excellent recommendation for dealing with a water leakage emergency from an upstairs bathroom. They are generous with their time and energy and got the job done right. Thank you, Marcus and Vivian for everything !" Based on 2 flood events when I have called Viviane's cleaning two traumatic leaks, this company is just excellent and the people are great. They are nice, responsive, and professional. They are in a business that you only have reason to call when you are in a crisis, and from my experience I give them highest marks. The respond to emergencies, get right to the cleanup, and make you feel like it will all be OK."
5★★★★★ - "I would like to give both praise and a thank you to Marcus Viana the owner of Viviane's cleaning Inc and his assistant Rafael . I own a building in Saugus with 8 Apts and 4 stores. Due to the accumulation of snow and ice, I developed a water leak from my roof which created water damage to the 2nd and 3rd kitchens and rear halls. I called my roofer, brother, and Viviane's cleaning and they all showed up very quick. After the leak was diagnosed and repaired, Marcus and his helper then went through all the tests for water damage inside the building. A few days later after the leak was stopped, Marcus , Rafael, my son and the Arbella Insurance adjuster went through all the damages. Because of Viviane's Cleaning assistance, my problem was resolved with the insurance company in a very prompt and efficient manner. Again thank you Marcus and Rafael"
5★★★★★ - "Viviane's Cleaning, these guys do an excellent job. We had them out to clean the office and windows and we were very impressed with the work they did. They were on time, courteous, and fairly priced. We highly recommend five star's for Viviane's Cleaning." 5★★★★★ - "Marcus and Vivian just cleaned our Store in Marblehead. He and his company, Viviane's Cleaning are very efficient. It was easy to schedule an appointment with him. He cleaned our whole store top to bottom about one week ago. He arrived earlier than the scheduled time and quickly did a spectacular cleaning job. The price was right and we highly recommend Viviane's Cleaning Services..."
5★★★★★ - "Viviane's Cleaning does an AMAZING JOB ! Great customer service, reasonable prices, spotless cleaning every week, and my time back to focus on my business instead of cleaning my business! Viviane's Cleaning is my #1 choice for commercial cleaning." 5★★★★★ - "Viviane's Cleaning , I have had nothing but positive experiences for both myself and referred clients to Viviane's Cleaning, Inc. over the last decade . It continues to amaze me how Marcus and his team provide the same exceptionally consistent quality of service over such a long period of time. Thank you, Marcus! Five stars for your company !!!" 5★★★★★ - "Viviane's Cleaning has cleaned our building for several years and we are thrilled to off load that responsibility to them. They do a wonderful job and we often recommend their services to our own clients. thanks Marcus !" 5★★★★★ - "I have been working with Viviane's Cleaning for many years and have had a wonderful experience ! Marcus and Vivian They are not only professional but extremely detailed in their cleaning and communication. I would highly recommend their services. They are truly 5 Star !" 5★★★★★ - "I have had nothing but positive experiences for both myself and referred clients to Viviane's Cleaning over the last few years . It continues to amaze me how Marcus and Vivian's team provide the same exceptionally consistent quality of service over such a long period of time , Thank you guys !" 5★★★★★ - "I was looking for emergency cleaning service nearby so I came to Viviane's Cleaning - very quick response, thank you so much Marcus and Vivian !" 5★★★★★ - "I had a wonderful experience with Viviane's Cleaning Services ! They did such a thorough deep clean and were wonderful to work with. They were very professional, and my wife and I were thrilled with the results! It was my first time using a cleaning service and I would definitely use them again!" 5★★★★★ - "We had a cleaning job for our house we had just sold in Topsfield - Ma . I Hiring Viviane's Cleaning The price was really reasonable and the job impeccable. I chose them because they could accommodate a last minute request for cleaning. I am glad I called them , Great Job , Marcus and Vivian , thank you guys !" 5★★★★★ - "We have been working with Viviane's Cleaning for almost 10 years, and recommend them highly. Marcus and Vivian and her crew are prompt, reliable, professional, super friendly, and best of all, they consistently do a great job. The always go above and beyond. I love their extra personal touches. If you're looking for help in your house, look no further , Thank you , great job guys !" 5★★★★★ - "I've been using Viviane's Cleaning for about a 2 year, and they're great! They communicate very clearly by email, Text to confirm every week, and they are very consistent and thorough with their cleans. I don't always have time to completely pick up before they come (though I try!) but they don't mind the clutter! (They just organize it into a neat stack for me, which really helps:) Highly recommend, Great Job, Thank you For Everything!" 5★★★★★ - "Marcus and Vivian did an excellent job doing a deep cleaning for an apartment that I am moving into. Marcus came out a few days beforehand and gave me an estimate that was very reasonable. Both of them were very nice and the cleaning was quick yet very thorough. They even cleaned some things free of charge. I was amazed by how clean the apartment was in just a few hours! Would highly recommend Viviane's cleaning for deep cleaning and/or other cleaning needs." 5★★★★★ - "Just wanted to drop you a line to let you know what a fantastic job Marcus and Crew did power washing my home today! I was amazed at the difference in the brightness of the siding and I have never seen the foundation and steps look so nice and clean! It looks like a new house ! Thanks for the great service guys !" Just wanted to let you guys know that Marcus and crew was out this morning to power wash my house and they did a great job. The house looks great. Marcus is a very nice guy and very professional. I would recommend your services to my family and friends. Thank you..."
5★★★★★ - "This is the best cleaning company that I have ever used ! Finally; Someone that shows up on time and does everything that Marcus and Vivian from Viviane's Cleaning both would do (and even a lot more ) and at a very fair price. I will definitely be using Viviane's Cleaning on a regular week basis... Thank you so much Guys, Great Job !" Very glad to recommend Marcus from Viviane's Cleaning for my retail store . I found him through Google , and found him to be every bit as good as the reviews say. Marcus is a real professional who follows through -- he responds quickly to requests for info, and provides the services requested. He did a fine job ( Post-Construction ) and ( Windows cleaning ) at my new store, Abercrombie & Fitch at a very reasonable price... He's also a pleasure to deal with. Two thumbs up for Marcus !" 5★★★★★ - "I found Viviane's Cleaning here on Google Plus . Good reviews, so I reached out and Marcus and Vivian were everything the reviews promised --- responsive, professional, timely and competitive. I was pleased with the service and would gladly recommend Viviane's Cleaning to my family and friends...."
5★★★★★ - "Viviane's cleaning service is fabulous. Marcus and Vivian are excellent people to do business with. Both are clear in spelling out exactly what his understanding is as to what work he will be doing and provides this in writing with the amount the service will cost. Marcus and Vivian are responsive, communicative, fair, and very nice as well. Thank you Guys !" 5★★★★★ - "We have been using Marcus and Viviane's services for over 6 months now. We hired them to clean our freshly renovated colonial in North Reading and could not be happier with the services they provide. They are extremely courteous and respectful of our time, always willing to accommodate our busy schedule. We really appreciate them paying great attention to detail and making sure that we are happy with the result. They are always very responsive to our requests and willing to go above and beyond. We love coming back home after Marcus and Viviane clean it spotlessly. They deliver a great quality at a very reasonable price. We would highly recommend their services." "Marcus was very professional! He came and inspected our apartment the next business day after calling. He was able to schedule our cleaning when we wanted, and the apartment came out great! Very easy to deal with and very good job." 5★★★★★ - "We have entrusted Viviane's Cleaning to clean our office for the past two years. Their professionalism and quality of work has been unmatched in this area. We have watched as Viviane's Cleaning has grown over the years without losing their attention to detail or their hands on approach. I highly recommend Viviane's Cleaning to anyone interested in quality commercial cleaning." 5★★★★★ - "We strongly feel that the cleanliness in our office has a strong effect on our productivity, and we can thank Viviane's Cleaning for helping to make our business so successful. They routinely clean our offices, and set us up on floor maintenance schedule that keeps our tile shining like new all year round. I have recommended Viviane's Cleaning to all my friends for their commercial, office and industrial cleaning needs. This company is simply amazing." 5★★★★★ - "Viviane's Cleaning services have been reliably cleaning for my home for over 4 years. They are extremely dependable and always have a high quality of work. In addition, they are very warm, nice people who we enjoy having in our home. My young children look forward to the days they come and often greet them with big smiles when they arrive!" 5★★★★★ - "Viviane's Cleaning has been cleaning my house for many years. Everything sparkles and shines after they leave! I have found them to be very responsible both professionally and personally Marcus and Vivian. I would recommened them to you unconditionally." 5★★★★★ - "Vivian and Marcus, since she's started her business. I wouldn't ever think of changing services. Vivian and Marcus is great, always eager to please, reliable and more importantly, both honest! In fact, when we're on vacation Marcus and Vivian comes to check my house and my pets. I've recommended her to several friends as well as family. Additionally, both a lovely person. I feel confident that both can do the job, large or small. I have no difficulty recommending Viviane's Cleaning, thanks for all you do for us!" 5★★★★★ - "I walked into the house today after our first cleaning and was blown away at how wonderful the house looks! Every inch of the house was cleaned and it smells great. It's very reassuring to know that all the chemicals used are non-toxic. I will highly recommend Viviane's Cleaning for Green Cleaning, to all my friends and family. They you guys; Marcus and Vivian, you the best!" 5★★★★★ - "Viviane's Cleaning, For Green Cleaning is the greatest. I have used Viviane's Cleaning, for Green cleaning serivce, for over six years. Vivian and Marcus are reliable, efficient and pleasant to know. Their cleaning in super. I recommend their services!" 5★★★★★ - "I have been using Viviane's Cleaning services for longer than I can remember. I have happily referred them to many neighbors and friends. I am 100% satisfied with every aspect of their service. Professional and efficient, Marcus and Vivian are the best!" "Viviane's Cleaning, For Green Cleaning is absolutely amazing. We needed cleaning done in an apartment our son and his wife were moving into. The previous tenants had 2 cats. You can imagine the cleaning that needed to be done to get rid of cat hair, dander and cat smells. First of all they made a special effort to do it the next day. What they accomplished was a miracle. This apartment is spotless. It was not an easy job, but I am very grateful for them. This is an extreme case. I will recommend them to anyone." 5★★★★★ - "Viviane's Cleaning, Pleasant. Thorough. Always providing a little bit extra. Marcus and Vivian have been tremendous. Their crew is professional and respectful. I am paralyzed and in a wheelchair. Rod would always do the little things that made my life easy. From taking away my Christmas tree, to replacing light bulbs, to changing bed linens, anything that was difficult or challenging for me to do, they gladly took care of it with a smile on their face. Reasonable prices, quality service." 5★★★★★ - "Viviane's Cleaning, Marcus and Vivian deliver the highest level of execution. From the moment I met with Marcus and Vivian to tour my home and discuss their services, I knew that it would be a perfect match. Marcus outlined every attention to detail as well as the bio-friendly products they use to get the job done. From door frames to walls, these guys do it all. Not only did Marcus five a good sales pitch, but he and the team delivered on every single promise from day one. Marcus and Vivian have gone above and beyond my expectations. Just last week for example, I was delighted to arrive home and notice that our porch had been cleaned from top to bottom. Though we had discussed from the beginning that this would not be expected, Marcus and Vivian took the initiative to clean it anyway. I give my highest recommendation to Viviane's Cleaning, and if anyone has inquiries regarding their services, would be happily discuss my experiences with them this past year!" 5★★★★★ - "I am going on 4 years with Viviane's Cleaning. I found them on Web and so thankful that I did! As a full time working mother of 3 boys; the service provided by Vivian & Marcus have been a God send! I also recently completed 2 years of night school for a graduate degree on top of working. Thank you Vivian and Marcus for taking a HUGE part of my stress away! My house sparkles and thanks to Vivian - our smiles do too! If I could give you 10 stars I would!" 5★★★★★ - "Vivian and Marcus did a terrific job cleaning our empty house before we sold it. 3 floor plus a very large basement. They arrived when they said they would and gave us an accurate estimate. We were very pleased with their work, Thanks Vivian and Marcus for an excellent job!"